West Indies batsman Shai Hope hit the first hundred in Group “A” play to earn bragging rights for Barbados Pride, and Windward Islands Volcanoes followed up purposeful bowling – led by their captain Shane Shillingford – with confident batting to complete their first victory in the Super50 Cup in Barbados on Wednesday. Hope hit a typically attractive, third Super50 career hundred and shared a record, fourth-wicket stand with fellow West Indies batsman Roston Chase before the bowlers destroyed the Combined Campuses & Colleges Marooners fragile batting to earn the Pride a 183-run victory at the Windward Cricket Ground. In the night-capper, a destructive spell from off-spinner Shillingford set things up before half-centuries from Kirk Edwards and Andre Fletcher formalised a six-wicket victory for Volcanoes over Hampshire at Kensington Oval. Entering the contest unbeaten so far in group play and with three wins on the bounce, Pride put themselves in a strong position, despite not being at their best. Hope warmed up for the ICC World Cup qualifiers next month with a cool 102 off 135 balls that included eight fours and three sixes, earning him the Player-of-the-Match award, and Chase supported with 72 from 66 balls decorated with four fours and four sixes. They shared 141 establishing a new record for the fourth-wicket for Barbados in the 42-year history of the Super50 tournament, eclipsing by five the mark set by Floyd Reifer and Ryan Hinds against Guyana 14 years ago at Bourda Oval. Hinds was superb bowling his left-arm spin, conceding a mere 22 from a 10-over spell that yielded two wickets. 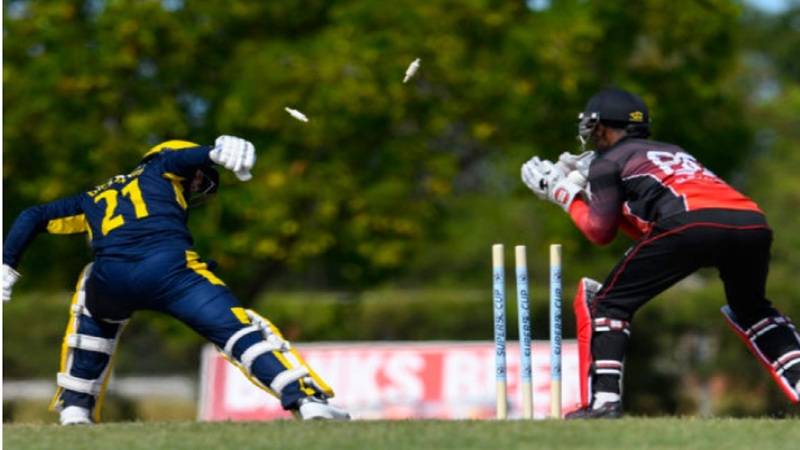 In reply, the batting of the Barbados-based Marooners once against proved their demise, as they collapsed for their lowest total ever in tournament history to surrender bragging rights to opponents that share their training base. Hinds, a former West Indies all-rounder, used his vast experience to eke out a top score of 32, but was the only one to pass 10 and just one of two in double figures. 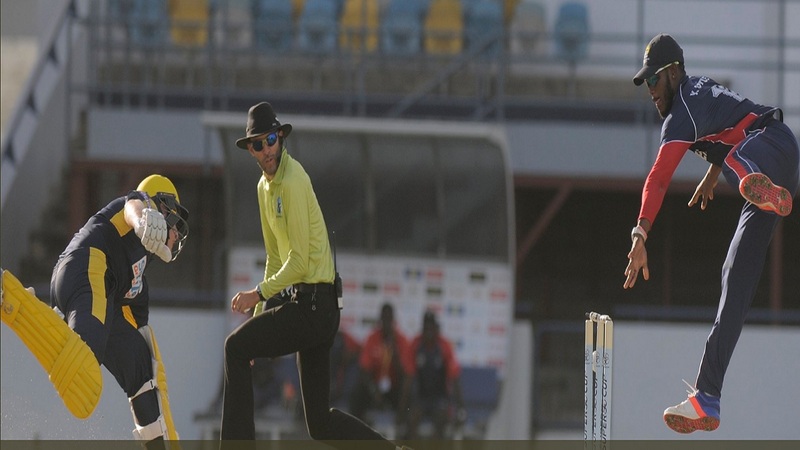 Teenaged fast bowler and former Under-19 World Cup winner Chemar Holder rocked the innings with 3-31 from seven overs before international spinners Sulieman Benn and Ashley Nurse put on the finishing touches with two wickets apiece. Both sides entered the match looking to kick-start their campaign, but it was Volcanoes that made all the running. Barbados-born Edwards, a former West Indies vice-captain, hit eight fours and one six in unbeaten 71 from 91 balls and West Indies Twenty20 star Fletcher had the same boundary count in 53 from 55 balls to power Volcanoes over the finish line. 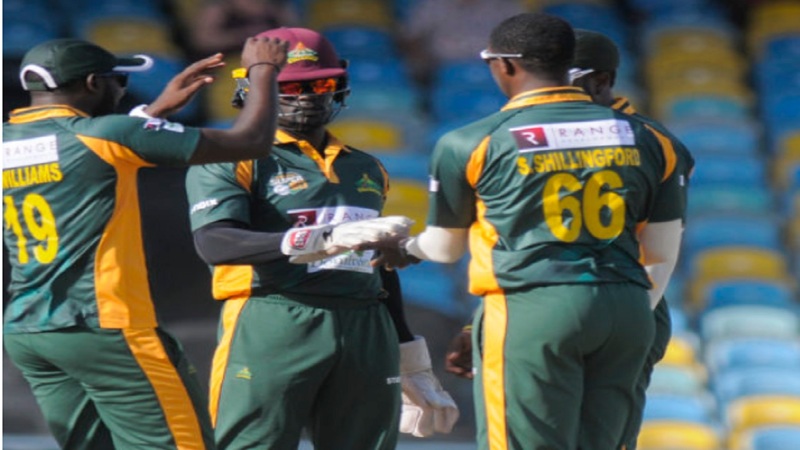 They put on 94 for the third wicket before Edwards went on to share reassuring stands with Kavem Hodge and Roland Cato that formalised the result. Barbados-born, former West Indies speedster Fidel Edwards was the most successful Hampshire bowler, snaring 3-52 from seven overs, but none of the others had a significant impact to offer a serious threat to the Volcanoes. Earlier, Hampshire captain Jimmy Adams held his side together with a fluent 83 from 75 balls that included 11 fours and two sixes before Shillingford triggered a slide with 4-32 in his 10-over spell that earned him the Player-of-the-Match award and saw the visitors slump to 142 for seven. But Bradley Taylor made 24 and Asher Hart got 21 in a stand of 41 for the eighth wicket to add some respectability to the Hants total.